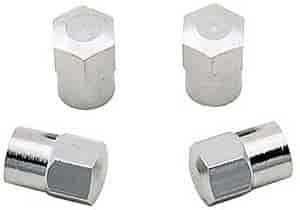 Mr Gasket Replacement Valve Stem Caps - Chrome 4/pkg. Replace those old worn valves stems with these new chrome plated valve stems! Heavy chrome plating and quality finish add the classic touch to your mag or chrome rims. Two or four per package. This advanced design tire valve will give any custom wheel a clean, smooth appearance by eliminating unsightly valve stems. Manufactured from the highest quality brass and beautifully chrome plated, these flush mount tire valves are engineered to fit all tubeless applications on most chrome, steel, or aluminum wheels. Packaged 4 per set with special inflator adapter included. 3663 - Mr. Gasket Tire Valve Stems is rated 5.0 out of 5 by 1. Rated 5 out of 5 by DCMcGee from Perfect Great looking tire valve stems. Glad I got these for my Tahoe.